The amount you’ll use of this concentrated soap in each load is ONE HEAPING TABLESPOON. That’s right! 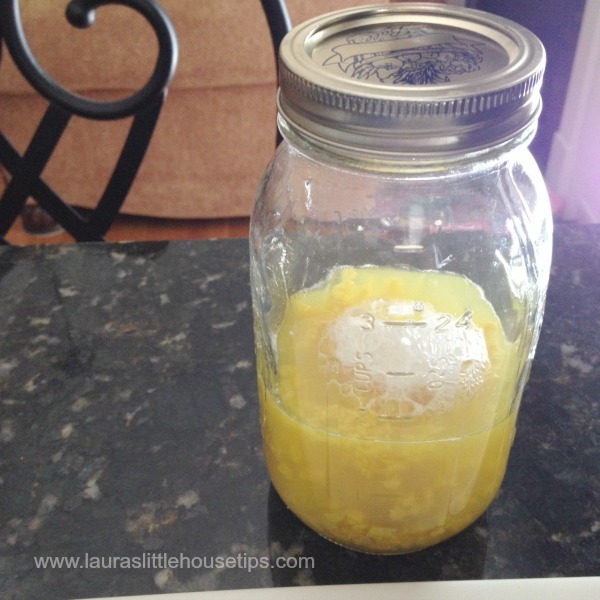 And the recipe I’m going to outline yields one quart jar – I wanted to see how I liked it, so I didn’t double it. But I definitely will next time! Then you’ll scoop them up and put them in your mason jar. You’ll put 1 1/2 cups boiling water into the jar and put the lid on. I cannot begin to describe how EXCITING this part was!!! NO GRATING THE SOAP AND MELTING IT DOWN – STIRRING ON THE STOVETOP!!! At this stage of the game I was feeling really hopeful – yet leery. How could this really work and be so easy? I just left it til the next day! 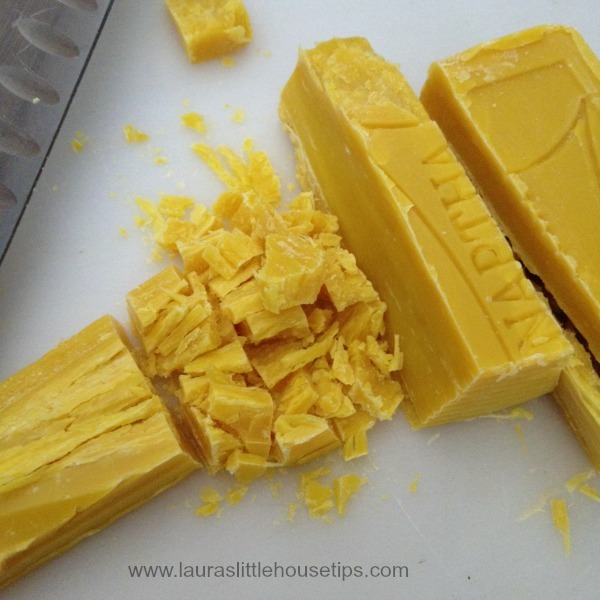 The next step is to take a butter knife and cut through the coagulated soap. Lots. You’ll see below when I first inverted my jar and put it on my blender, the soap didn’t release. I realized I had cut through the soap but I needed to ‘encourage’ it to loosen a bit from the bottom as well. So I just back tracked and went in and did that and put my lid back on. Good to go! 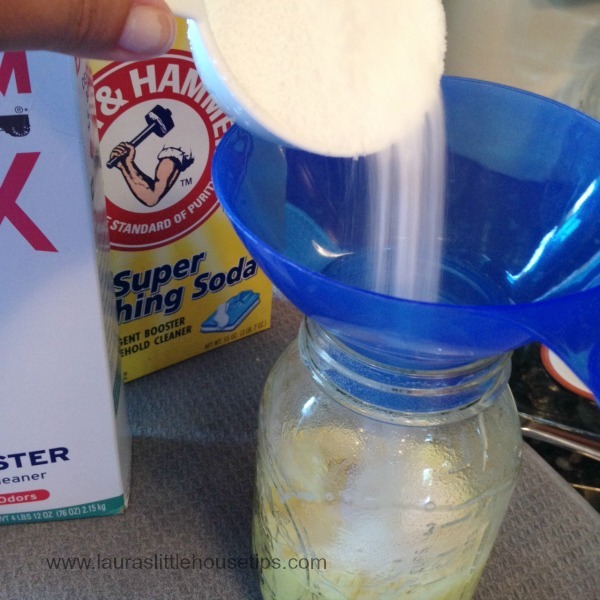 Add your 1/2 cup Borax and 1/2 cup Super Washing Soda. I also add my essential oils at this point. I use grapefruit and it doesn’t make the laundry actually smell like grapefruit but it’s a beautiful, fresh, crisp clean scent and I love it! You’ll add enough boiling water to bring your Sauce mixture up to the point at which the jar just begins to narrow at the shoulder. (meaning the highest point on the jar that is still the widest width) I did blend and see there was more room than I thought in the jar so I added just a little more boiling water and blended again, but you don’t want to overload your jar by any means. Head space is important so you don’t end up with a mess on your hands. Make sure when fitting your gasket and blade from your blender on the top of your jar that you line them up perfectly and that all pieces including your jar are clean and dry. You don’t want anything interfering with your seal. 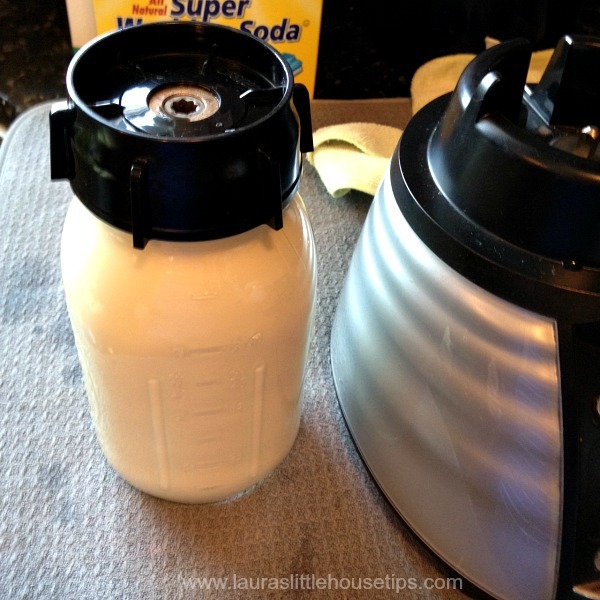 Place the cover over your blender attachments and invert your mason jar onto your blender. This is where I had to take my lid back off and use my butter knife to loosen the soap from the bottom of the jar. The blending takes about 20 seconds on high! That’s it! 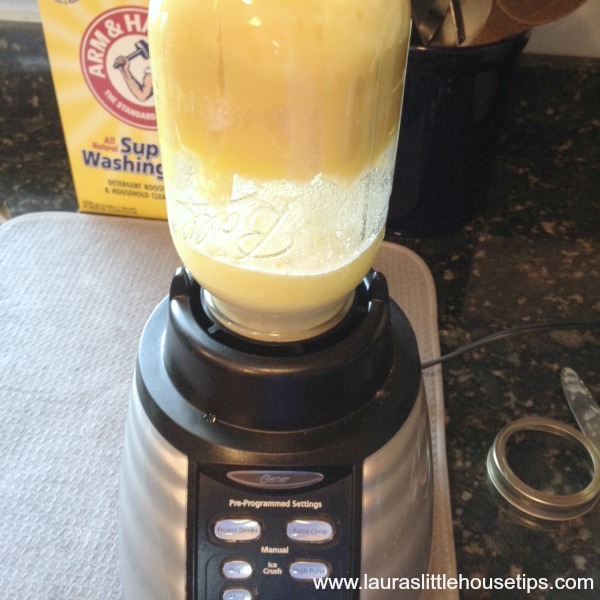 So easy and fast – I’m so excited to have an even more concentrated version of my original recipe. After a few days it does set up a bit. It’s still soft, but I just keep a Tablespoon in my laundry area and scoop a heaping Tbsp letting my washer water run it off the spoon. (and to save money, I wash in cold – always. I believe friction is the main cleaning agent and I’ve never been disappointed. I dry all of our laundry on the line which takes care of germs and bacteria, so I don’t need any type of “sani-rinse”! haha) The soap would probably dissolve just fine but that’s a pet peeve of mine – I like to see it worked into the water well before I add clothes but I don’t want to wait for it. I keep a DollarTree stainless steel whisk right by my Sauce and give the water a quick thrashing and I’m done! Pet peeve satisfied. I have always been so pleased with this recipe but now even more-so! My laundry is clean and smells fresh and more importantly I save $ BIG TIME! 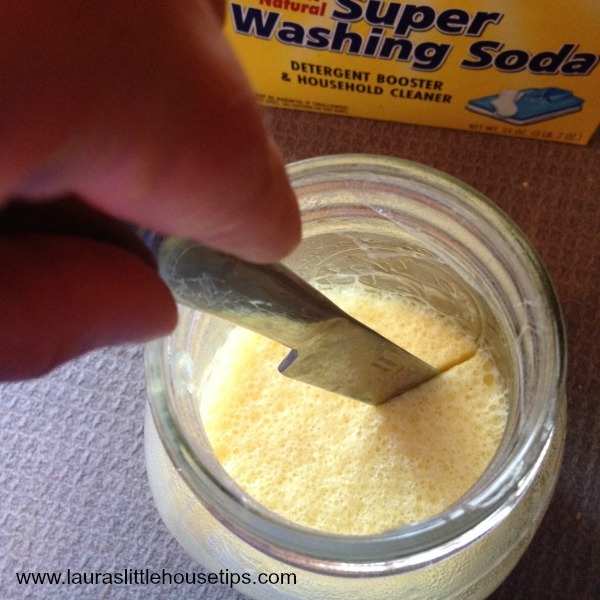 Do you make any of your own household cleaners or detergents?? We’d love to hear your thoughts! I have never tried this before. I want to give it a try, especially since I do so much laundry around here! Oh Daisy — isn’t that a dirty word!? hahaha… I honestly don’t think I’ll ever buy detergent again. The cost breakdown is ridiculously amazing. I might actually give this a try. I like the idea of a homemade product versus something store bought. Robin (Masshole Mommy) recently posted…Like Many Women My Age, I am 29 years old! Please let us know Robin! I’m super excited about it being even easier than the way I used to do it! So much cheaper too. I love this. I’m always on the lookout for household cleaners that I can make myself. That way I know what’s in it and what isn’t. I’m glad you liked it Courtney! I’m so thrilled it’s even easier now! This method saves me even more time! Who knew you could make your own laundry detergent? Cool! Great post. I always love finding recipes to replace store bought household cleaners. It just feels safer to me to know what’s in the cleaning products I use. Thank you so much Jennifer! I appreciate your encouragement! Now that’s very neat. Do you think it would work in an HE all in one? Oh goodness Ellen.. I’m not familiar with those types of models. I wouldn’t feel confident to say one way or another. But maybe a goole search or even a quick call to the customer service line of your brand of machine? Yes, it works in my HE…been using it for three years. You cannot put it in the dispenser, though, or it will clog. Just put a heaping spoonful on your dirty clothes and set your machine to the preferred setting. Interesting but think I will stick with my laundry soap pre made by a company. Nolie… here’s to knowing what you like! 🙂 Thanks for stopping by! i’ve been making a similar version of this for years now. nothing gets stains out like that fels. 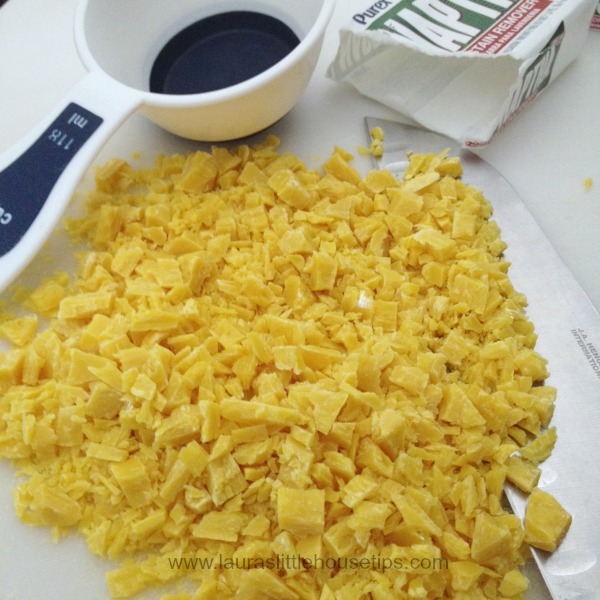 Candice… I was so thrilled this method makes this recipe even easier! I remember my sister using Fels for stain treatment when I was young but no one in my family ever made laundry soap out of it. Thank you for the feedback! 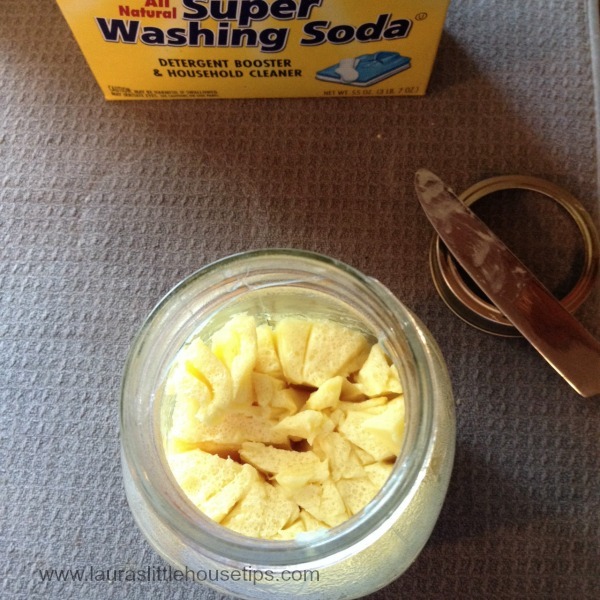 What a great idea to make your own laundry soap! I bet you can save so much money that way! wow, I bet that saves a ton of money over the course of a year! I might just have to give this a try. It’s easier to make than I realized. Come back and let us know if you do, Angela! Tell us how you find it – I’d love to hear! Thanks for stopping by! 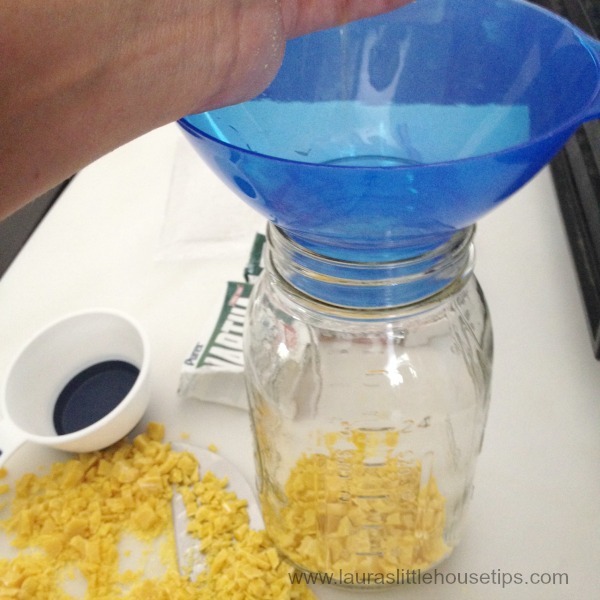 I made a similar homemade detergent, saved us a ton of money but faded my colors like crazy. I love to use it on my whites though! Oh wow Aimee… I haven’t experienced that! That’s too bad. Was it this recipe or did you have any other ingredients? I’m curious! I love the name laundry sauce, you should sell it. I’d totally buy a jar. HA! I love it too! I can’t take credit for that name though… that came from budget101.com. It totally pulled me into the idea and I’m so glad it did!!! Holy Moly that is beyond awesome! 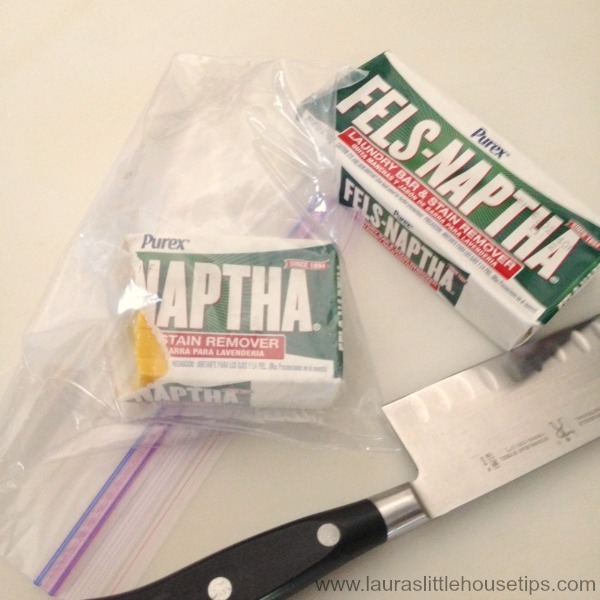 I have made soap with Fels Naptha but not like this, gonna have to try this out! Oh cool Kelsey! Let us know please! I am so so so excited how much easier this method is!!! I hope you enjoy! I’ve never seen a homemade cleaning cream like that before. Most all I see is a liquid or powder. So this is pretty cool! I love the way this looks and how simple it is.. I sooo have to try this… can’t believe how simple this was… thanks for sharing…. You’re welcome, Melanie! 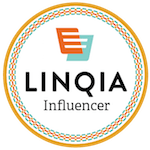 – It has so made my life easier… the other method just took so long! Thanks for the feedback! I have never tried making laundry soap. Now, I want to pick up some washing soda to try it! I don’t think I’ll ever buy any store bought again, Amy. The cost breakdown is just amazing. I’ve made my own laundry detergent before, but I haven’t in a long time. Thanks for the DIY! You’re welcome Pam! I’m really glad you liked it! I had no idea that you could make your own laundry soap. What a great idea and a good way to save some money. Thank you Ann… I am perfectly happy with the performance of this recipe and I really don’t think I’ll ever buy store bought again. Once you have the ingredients on hand it’s so easy to whip up a batch and the cost breakdown is so economical! Wow, this sounds amazing! Looove that it’s so fast to make too! 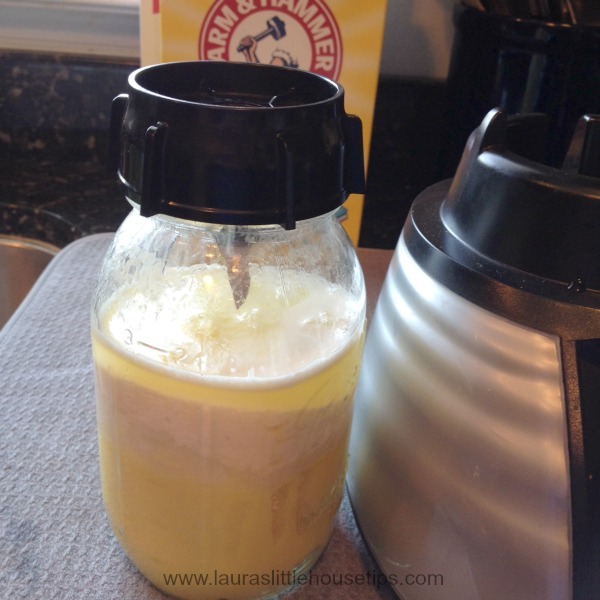 Making DIY laundry detergent has been on my to-do list for years.. I think it’s time that I jump on board! Thanks for this! Oh good Dawn! I’m glad it served a purpose for you- really! I’m glad you enjoyed it. Not only would I love to try it for clean laundry reasons, but just because it sounds so fun to make! It does set up after the initial “sauciness” Liz but YES!-fun!- I can’t tell you how wonderfully simple this method is! I have tried to make my own detergent before but it was an epic fail. Mine was not liquid maybe that was the problem! Mama to 5 BLessings recently posted…Tommee Tippee Pacifiers Are My Baby’s Favorite! I’ve always had a “thing” about soap dissolving before clothes are added – I guess that’s why I’ve always avoided the powder! This is crazy awesome! I need to get a couple of the ingredients but I’m going to try it. No I have never made my own detergent or even thought about doing so. Great it’s working for you! I’m really glad you dropped by – it’s always good to shard ideas! Never made my own detergent. Great tips! You make it look so easy. Marina @ Mommy Snippets recently posted…Yet to visit Alabama? Enter the HUGE road trip giveaway! Thanks Marina… I find it easier than running to the store. hahaha 🙂 Glad you enjoyed! That looks easy to make. 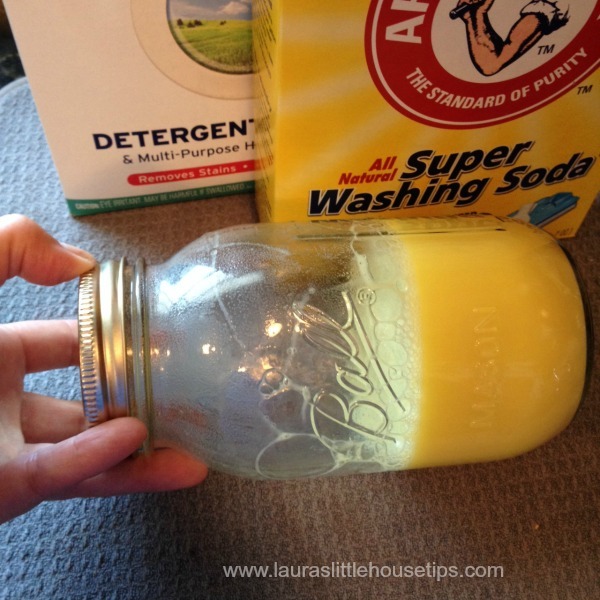 I had never thought of a more concentrated homemade detergent before! Wow! I would have never guessed making detergent would be this simple. Thanks for sharing. Sarah… I was so tickled to find this method… so much easier! I’ve been looking for a great recipe. Looking forward to trying this! Oh good Racquel! I will really look forward to hearing what you think of it! You’ve taken your laundry soap making process much further than I have. I stop when its at the powder form – but now I really need to take it to this consistency. I like the idea of adding the grapefruit essential oil as well. I’m definitely going to try this – what is the ratio of detergent to load at this consistency? I never thought about making my own laundry soap. What a great idea. Especially if you have sensitive and can’t use some laundry brands. Onca, I was reading yesterday about a recipe without borax… I may play with that but I’m so happy with this recipe. Thanks for stopping by! Wow, this is amazing. 🙂 Seriously? Takes 5 minutes? I love that you make your own soap. With the amount that I use with a family of six I could probably save by making my own too! I was using the old recipe like you were, this one is so much easier and faster! Who knew!!!! I just started this and can’t wait to see the end result tomorrow! Thank you for sharing, I love making my own soap! I wonder if you could use an immersion blender instead? Of course you can Terry. In fact it fits very well in the jar 🙂 Thank you for checking us out. I just saw this on hometalk and came here to get more information. My husband makes our laundry detergent and I love how well it cleans and how much money we are saving not buying the chemicals! I love that we can customize … powder, liquid and now “sauce”! WIll give it a try! So ONE Tablespoon is sufficient for a full load? I have a He front loading washer will this product work? You must live in a warm area to only use cold. I have a front load washing machine. Do you know if this will this work in the dispenser for a front loader? I have been using this recipe from budget101.com for three years and I love it! Mixing up four batches (8 jars) is easy-peasy cheap and we have enough laundry detergent to last months. I, too found this recipe on Budget 101 and have been using it for about 6 months. I love, love, love it!!! I actually make mine in an old icecream bucket and double the recipe above. Here is the only difference in mine. I use a hand mixer!! A $10 handmixer from Wally world. When finished it looks like a whip, good enough to eat lol BUT DON’T. My mixer stays with my ingredients since that is what I bought it for. Don’t know if this will help anyone else but I love it, wouldn’t do it any other way now. It does separate a little so I just give it a stir before removing my heaping Tablespoon. p.s. 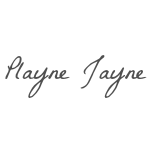 I included my blog website but right now it is still just inspirational (christian) material. I am working on another one that I hope to have going soon with reviews, recipes, etc. Thanks and God bless. Lately when I make this it starts to separate in the final phase and I have liquid on bottom and the correct version of the sauce on top. I haven’t changed anything and can not figure this out. Anyone else? I make my own powdered soap using har bar soap like Fels-Naphta,boxed laundry borax, super washing powder and the difference between this recipe in the article and my own is that I ad in a laundry booster like Oxi-Clean. Occasionally I ad in powdered Tide Detergent for HE washers. I don’t bother to melt the Fels-Naphta, (even though I use a High-Effecieny washer we all know that HE waher snever y gets hot enough due to being under government reg’s to prevent hot water use unless you disable this function – can be found on YouTube.) Without heat the bar soap is slow to melt so this is why we grate it down to tiny slips instead.) Grating the soap seems to help it disolve in the HE washer. (I’ve never seen any left over hard bar soap when it’s ground down this way.) if you are using an older hoter water guzzler then do whatever you want. 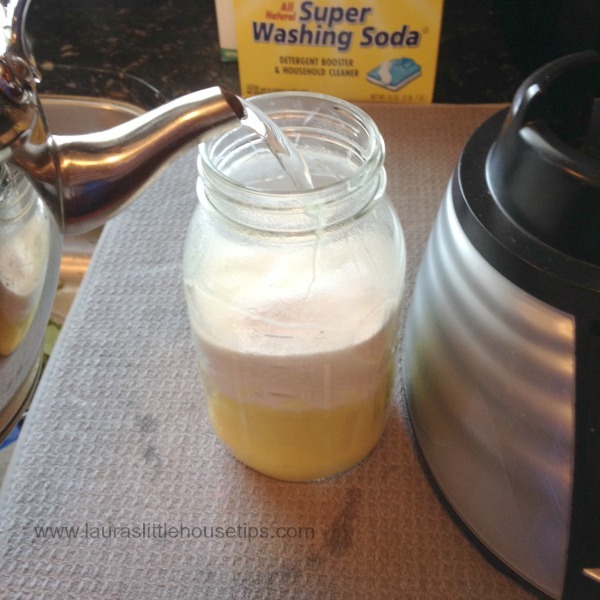 This recipe makes a low sudsing detergent which is perfect for all HE washers. 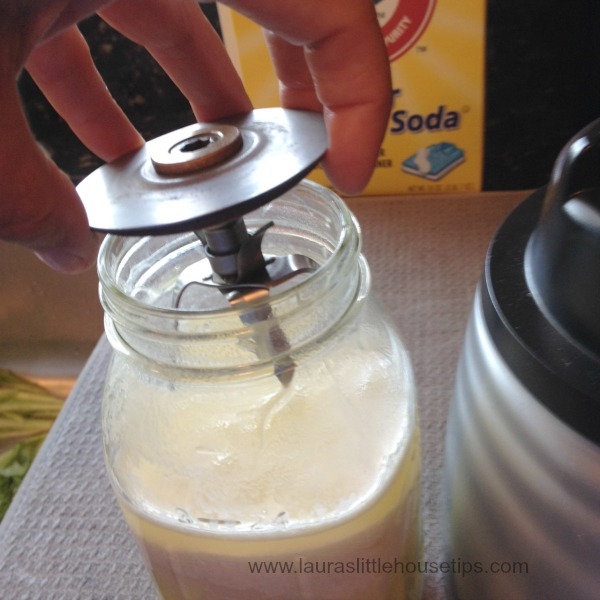 Second, if using a mason jar, it’s easier if you can obtain a wide-mouth jar. In my area it’s hard to find the larger one gallon jars like your showed in your cover photo. IN my area we have to order one on-line. But quart size jars are readily available (I can actually get my whole hand into the wide mouth jar and my magic bullet ice attachment easily fits on both Ball and Mason wide mouth jars. Measure by hand if you are unsure. 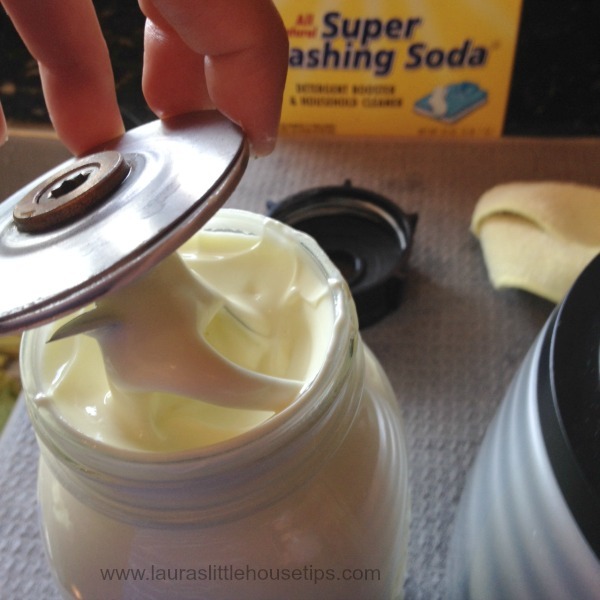 If planning to put the soap cream into a jar of any kind, pre-fit the grinding attachment to the jar before even beginning to avoid frustration later in the project. I discovered when I used a old brand antique jelly jar that I had to make my own gasket for the magic bullet to prevent liquids running out . I store my coffee grinds in this beautiful decorative antique jar.